Luc de Clapiers, Marquis de Vauvenargues (1715-1747), by Charles Amédée Colin. A current work in progress at the Voltaire Foundation relates to one of Voltaire’s less-discussed friendships that ended all too soon due to a fatal illness. 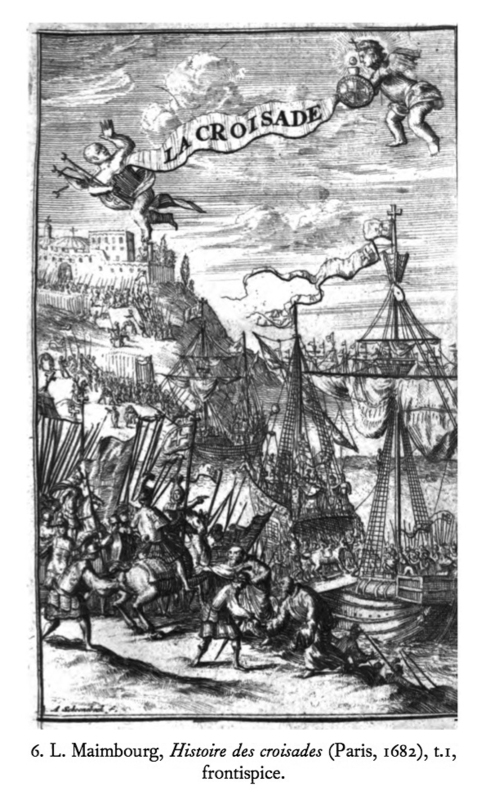 On 4 April 1743, Luc de Clapiers, Marquis de Vauvenargues, penned the philosophe an enthusiastic letter comparing the merits of France’s two most celebrated tragedians, Pierre Corneille and Jean Racine. The combination of strong opinions and well-placed flattery must have caught Voltaire’s attention, for he wrote back less than two weeks later. The 27-year-old Vauvenargues brazenly criticised Corneille’s declamatory style and lack of subtlety, arguing that ‘surtout Corneille paroît ignorer que les hommes se caractérisent souvent d’avantage par les choses qu’ils ne disent pas, que par celles qu’ils disent’. 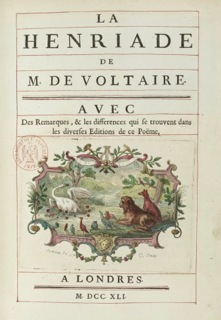 Never one to stand at the sidelines of a literary debate, Voltaire’s reply praised Vauvenargues for his good taste in preferring Racine while offering a judicious defence of Corneille, counting that ‘il y a des choses si sublimes dans Corneille au milieu de ses froids raisonnements, et même des choses si touchantes, qu’il doit être respecté avec ses défauts’ (15 April 1743). This began a lively exchange between the two men, as Vauvenargues iconoclastically refused to yield ground to Voltaire’s more balanced take on the playwright’s merits and flaws: ‘Monsieur, Je suis au désespoir que vous me forciez à respecter Corneille’ (22 April 1743). As well as offering us an entertaining example of an eighteenth-century celebrity’s interactions with a fan, this exchange is important because, after befriending Voltaire, Vauvenargues began to see the philosophe as a mentor figure, asking him for advice on his own Introduction à la connaissance de l’esprit humain, which was supplemented by his Réflexions et maximes and published for the first time in 1746. Any PhD student can imagine the huge sigh of relief Vauvenargues must have let out when Voltaire wrote back on 15 February 1746 to say that he liked it even before he had finished reading it. 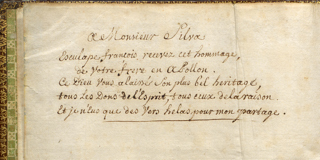 The young author’s joy is palpable in his response to his mentor’s praise, thanking him for taking the time to provide suggestions and corrections for the work’s improvement (15 May 1746). 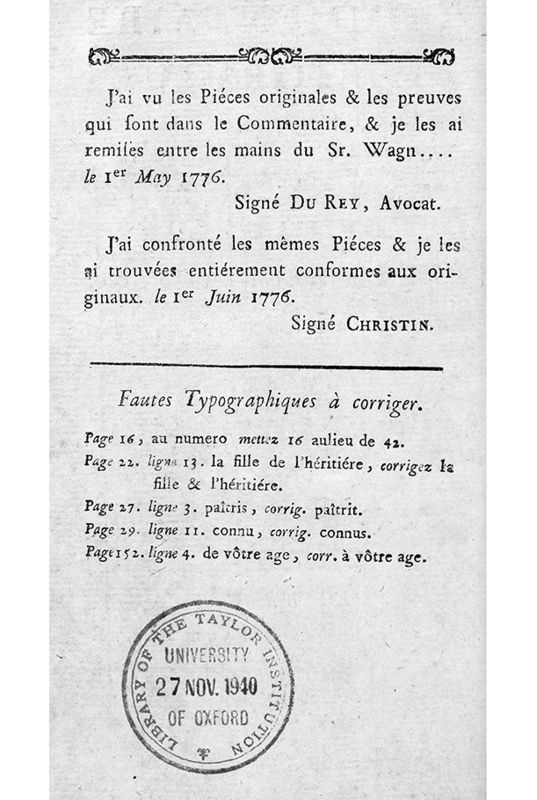 Vauvenargues then substantially revised his text and published a second edition in 1747. 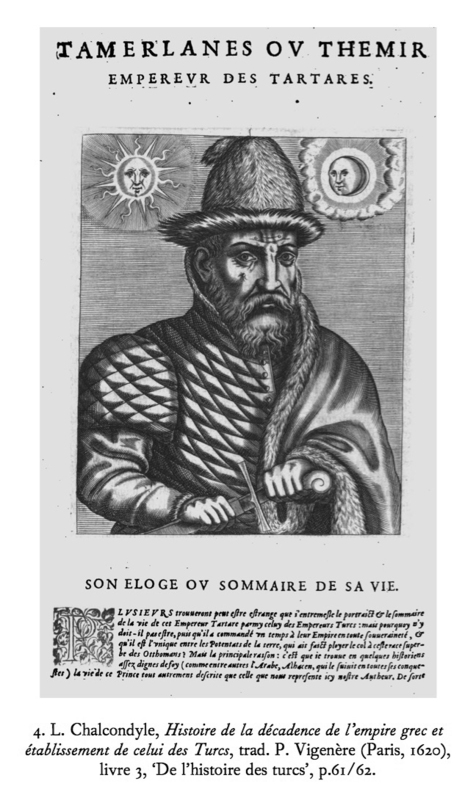 Introduction à la connaissance de l’esprit humain, p.79 (Bibliothèque Méjanes, Aix-en-Provence). 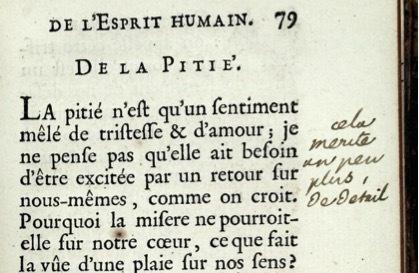 As part of our work on Voltaire’s marginalia, we are interested firstly in the kind of suggestions the philosophe made in the annotated copy he sent back to Vauvenargues, and secondly to what extent did the latter incorporate these suggestions into the revised version of his book. 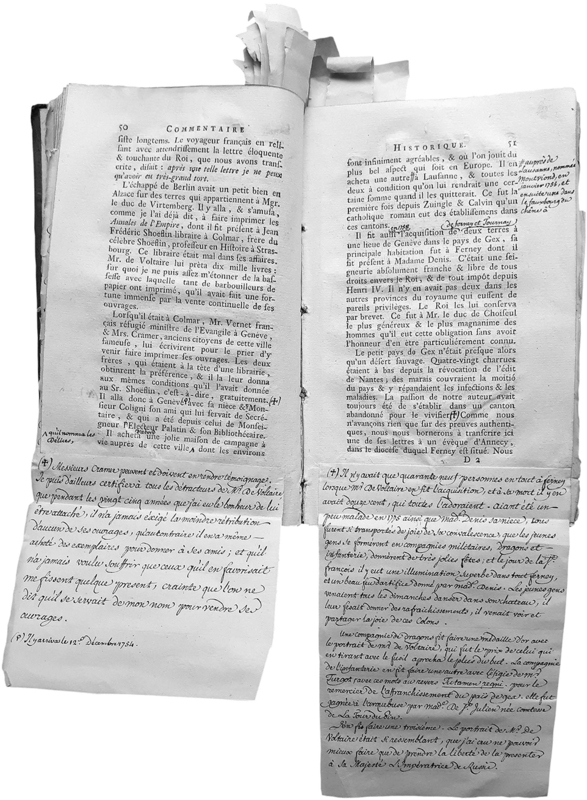 The work of cross-referencing the annotated first edition and the revised second edition revealed some interesting patterns. 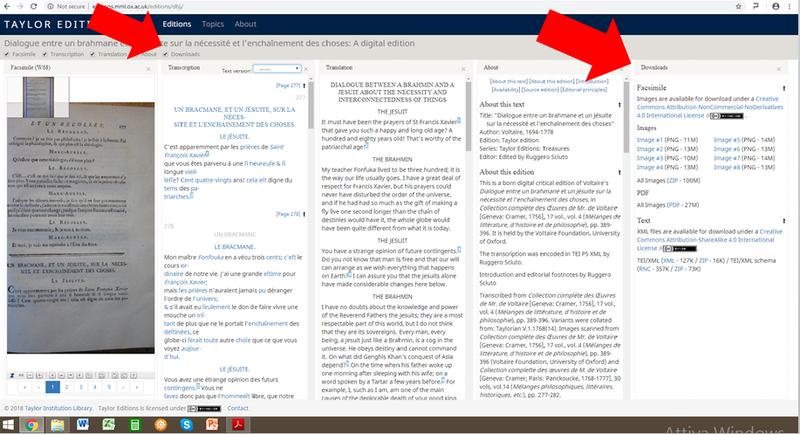 In the cases where the corrections are easy remedies, for example a different choice of wording or a quick clarificatory remark, Vauvenargues has mostly deferred to Voltaire’s wisdom and edited his manuscript accordingly. Things got trickier when Voltaire suggested structural changes or major additions, both things which Vauvenargues appeared more reluctant to carry out. This is most likely because the revisions were extremely time-sensitive, given that Vauvenargues was in ill-health and had to rush to edit and publish the second edition of his work before he died later that year at the age of thirty-one. It is perhaps for this reason that he did not find the time to develop a section on page 75 by which Voltaire has scribbled ‘cela merite plus de détail’. Introduction à la connaissance de l’esprit humain, p.86 (Bibliothèque Méjanes, Aix-en-Provence). As with any patterns, there are notable exceptions. More mystifying are instances such as on page 86 where Voltaire asks ‘pour quoy longue?’, seemingly questioning Vauvenargues’s choice of adjective. This should have been an easy fix for the marquis. 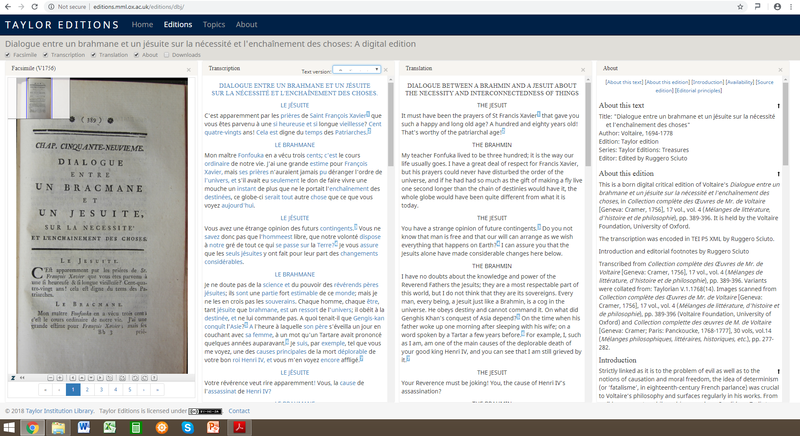 In the second edition, however, Vauvenargues has edited this sentence but kept the very same adjective that Voltaire did not like: ‘L’étonnement une surprise longue & accablante; l’admiration une surprise pleine de respect.’ Similarly, one of the sassiest comments can be found on page 88 where Vauvenargues writes that ‘il y auroit là-dessus des réflexions à faire aussi nouvelles que curieuses’, to which Voltaire witheringly retorts ‘faites les donc’. 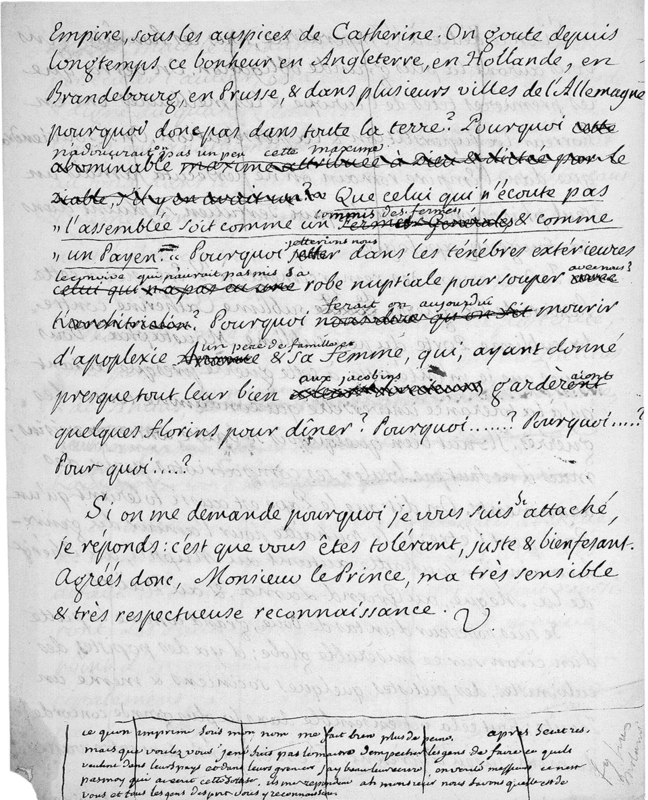 Vauvenargues does indeed revise this passage in his second edition, but chooses not to elaborate on what these reflections might be, writing that he has ‘ni la volonté, ni le pouvoir’ to do so. 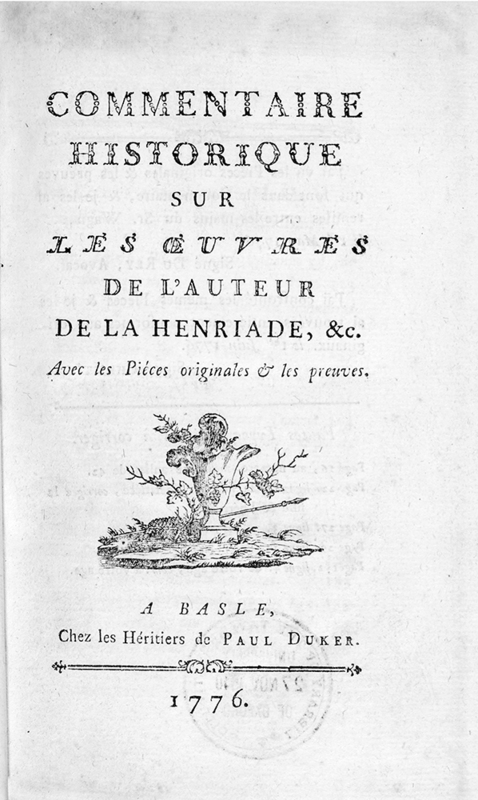 Introduction à la connaissance de l’esprit humain, p.88 (Bibliothèque Méjanes, Aix-en-Provence). 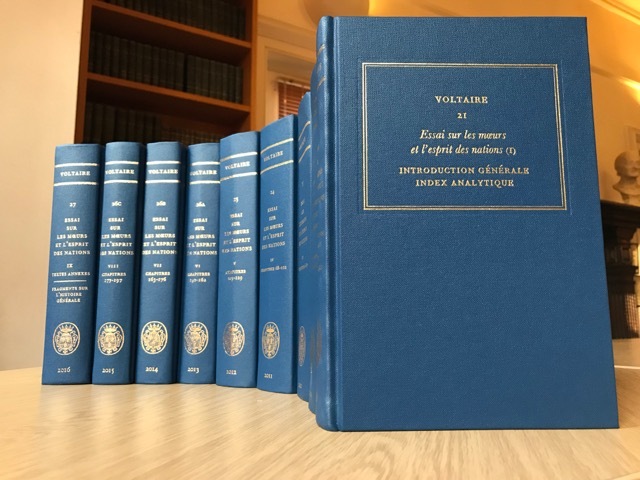 Like any good supervisor, Voltaire does not hold back in his criticism of his student’s work: what is most striking is the sheer volume of corrections, additions and suggestions, some of which are more helpful than others. 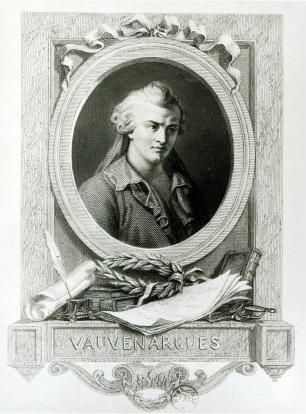 Sometimes he is perhaps a little harsh, accusing Vauvenargues of writing ‘mauvaise poésie’ on more than a couple of occasions. One of his most scathing comments comes towards the end of the list of maxims that forms the second part of the text. Vauvenargues makes the not-very-insightful remark that ‘quelque amour qu’on ait pour les grandes affaires, il y a peu de lectures si ennuyeuses & si fatiguantes que celles d’un Traité entre des Princes’, next to which his mentor has incredulously scribbled ‘c’est bien la peine d’imprimer cela?’ It’s safe to say that any PhD student would be horrified to have elicited such a remark from their supervisor! Introduction à la connaissance de l’esprit humain, p.364 (Bibliothèque Méjanes, Aix-en-Provence). But above all, Voltaire is a meticulous reader, picking up on ideas repeated from many pages back and highlighting the slightest inconsistency. 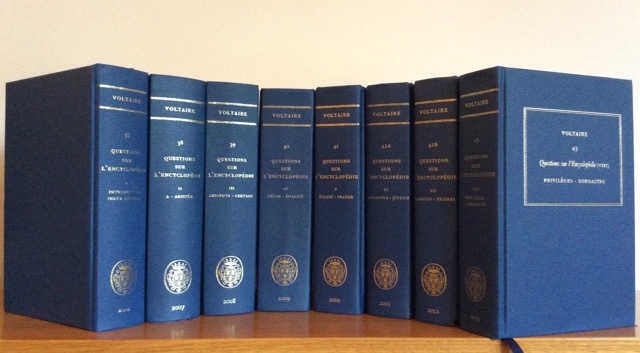 Equally, neither does he shy away from complimenting Vauvenargues’s work when it is deserving: several sections receive a smattering of ‘bien’, ‘beau’, ‘fort’, ‘excellent’ and even a ‘fin et profond et juste’, which more than make up for the moments of criticism. Sam is a PhD student at the University of Durham and a frequent VF collaborator. An earlier blog post on this same subject by Gillian Pink can be found here.